A computer-based system designed to prevent train accidents has been stalled by high costs and technological hurdles. 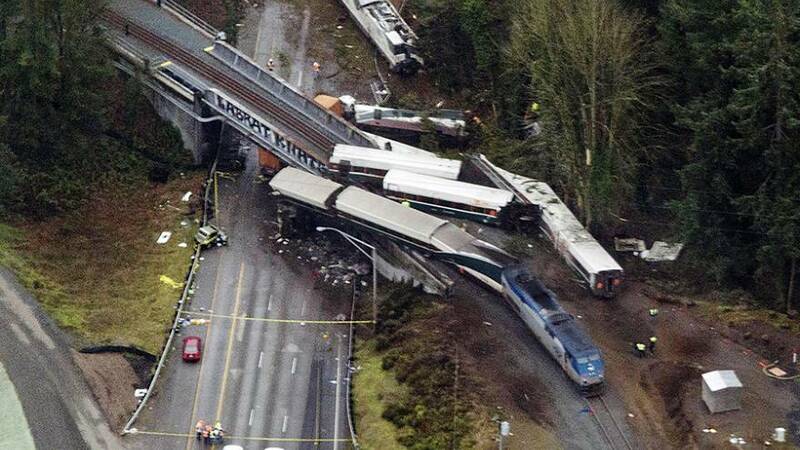 It was not being used by the train that derailed Monday in Washington state, killing at least three people. Federal investigators confirmed late Monday that the Amtrak train was going 80 miles an hour in a section of track designed for 30-mile-an-hour speeds. So-called Positive Train Control (PTC) systems are designed, among other things, to prevent trains from speeding. It was a head-on crash between a passenger and freight train in Los Angeles in 2008 that moved Congress to mandate PTC systems on all major rail lines. The changes were supposed to be completed by the end of 2015. But implementation was postponed because of the the huge pricetag — up to $22.5 billion over 20 years — and because of the innumerable complications in coordinating technology between multiple freight and passenger carriers and in mapping millions of data points — including switches and signals. Only 456 miles of tracks had fully implemented Positive Train Control systems as of the start of 2017. The Federal Railroad Administration reported in March that, as of the end of 2016, the automated safety technology had been activated on just 16 percent of tracks for freight railroads and on just 24 percent of passenger railroad lines. That was a slight improvement for both, but left a long way to go for the U.S. railroads to have Positive Train Control in operation nationwide. Inter-city and commuter rail passenger lines now have to meet key implementation milestones by the end of 2018. That means that all of the hardware and software must be installed and at least 50 percent of the route miles must be operable, according to the Association of American Railroads, a trade group. If those requirements are met, railroads can then get an extension until the end of 2020 to test out the new systems. "We continue to closely monitor railroads' progress implementing Positive Train Control," Patrick Warren, the railroad administration executive director said in the spring. "With less than two years remaining to complete the implementation process, it is imperative that railroads continue to meet implementation milestones." The AAR said that federal guidelines are supposed to prevent train-to-train collisions; derailments caused by excessive speed; unauthorized incursions by trains onto sections of track where maintenance is occurring and the movement of trains through track switches left in the wrong position. "Essentially, we're developing a new safety system from scratch that needs to seamlessly serve a massive transportation system," expert Jeff Young wrote of the new requirement, on the Association's website. "It's like creating an entirely new air traffic control system, and it needs to be meticulously choreographed to ensure that it's going to work safely. It's not going to work perfectly right out of the box, so careful testing of the entire system is essential for making it safe." A system that is not properly designed and implemented could lead to "false clear" signals, allowing locomotives to pass through stop signals because the train's on board system is improperly saying the path is all-clear when it is not. Faulty systems could also lead to the opposite problem — trains being needlessly stopped when they receive electronic evidence of a train on the track ahead, when there actually is none.